January 6, 2015 – My husband made a wonderful trail through the backyard with the snow blower today. The snow is only about a foot deep but for the two Jack Russells and the Papillion dogs we have with us this week, it means they can still run to their heart’s content for a few more days. Even the big dogs enjoy the ease of touching a hard base and not having to tire themselves out slogging through snow up to their chest. The little guys are smiling non-stop because they love to run and the trail is practically a tunnel-of-fun for them. They speed around it like a ball in a pin-ball machine! The trail hits grass here and there so it also gives them a little less stress on their cold paws. I had fewer clumps to knock out between the pads when they came in. But the freezing temperatures were another thing today. We spent most of the day at -25 C (around -13 F) but the wind was harsh, dropping the temperature another ten degrees at least. It was chilly on the face and fingers while we went out to do our pet sits today. This means we had to keep vigilant for signs of cold paws and cut a couple of visits short on the walking portion. Dogs are masters at hiding discomfort and when they have the opportunity to be out for a walk or enjoying company, they try their best not to show you they have cold paws. So it’s up to you to notice, pet sitter! Redistributing weight from one paw to the other. Much like lifting a t, which can injure his paw. If there’s no snow, he’s getting frostbite so take off your glove and warm his paw in your hand for a few moments until you can get him moving and somewhere safe. Limping. Same as above…if it’s a ball of snow turned icy, get it out of there. And try to warm up the paw. You’ll also need to be mindful of salt and other corrosive materials you or your town puts on the roads to melt the ice. It can burn the sensitive area of the paw and if your dog licks it out, even later when just licking his paws inside, it will make him sick. Consider having a bowl of warm water to dip his paw into when you bring him in and towel him off. 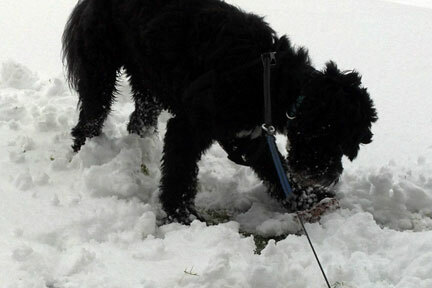 For or more information, visit the website at www.petsittingknowhow.com and read up on How to Survive Bad-Weather Dog Walking.